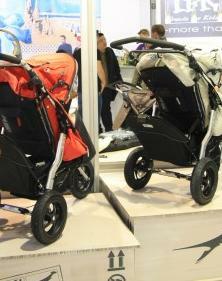 TFK (Trends for Kids) have surprised us by showing a tandem option at the Kind and Jugend show 2011. The photo appears to show what we believe to be a TFK Joggster Twist with an add on rear seat. This looks really exciting. We hope to find out more about this.